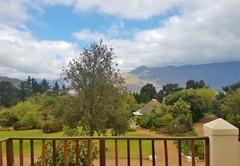 Val d'Or Estate is a 4 star graded B&B with self catering option, offering Franschhoek accommodation for tourists and visitors of the Cape Winelands. 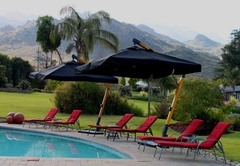 Nestled in the foothills of the Western Cape’s magnificent Franschhoek Mountains is a beautiful boutique guest house. 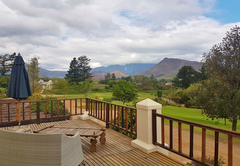 Only minutes from the centre of Franschhoek - the Cape’s culinary capital - lies Val d’Or, where the welcome is warm, the tranquillity tangible and the ambience geared to your comfort. Val d’Or offers both guest house and self-catering accommodation. All rooms and units have DSTV, DVD player, wall safe, robes, slippers, hair dryer, tea/coffee making facilities, bar fridge, plus under floor heating and air-conditioners to ensure your comfort all year round. 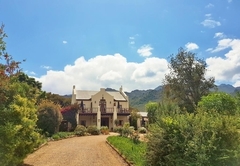 The Manor House consists of a country kitchen, an elegant dining area, a cosy lounge and TV room with satellite television as well as a sunny breakfast area where you can enjoy breakfast indoors or under the shady trees. There are four bedrooms consisting of one deluxe room with full bathroom, two deluxe rooms with shower bathrooms, and one standard room with shower bathroom. Each bedroom has its own private patio and different views of the surrounding gardens and mountains. Also, DSTV, DVD player, wall safe, robes, slippers, hair dryer, tea / coffee making facilities plus under floor heating and air-conditioners to ensure your comfort all year round. An honesty bar is situated in the main kitchen. There is also a barbecue area which may be booked and used by all guests. 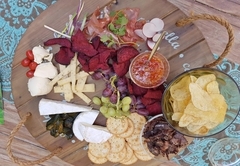 The Barn House comprises guest house accommodation as well as one self-catering unit. It has a sunny breakfast room, lounge area, library and bar area (fully licensed), stretching onto a wide patio facing the pool area. It is also home to Reception. Wireless hot spot available. The Barn House offers four luxury bedrooms: two luxury family suites on the ground floor, and two luxury gallery rooms on the first floor. The family suites each have their own full luxurious bathroom, DSTV, DVD player, wall safe, robes, slippers, hair dryer, tea / coffee making facilities, bar fridge, lounge area, sleeper couch (children under 12 stay free), plus under floor heating and air-conditioners to ensure your comfort all year round. The upstairs gallery rooms each have their own full luxurious bathroom, DSTV, DVD player, wall safe, robes, slippers, hair dryer, tea / coffee making facilities, bar fridge, under floor heating and air-conditioners and share a sitting room and balcony upstairs for their own exclusive use. Attached to the Barn House is a deluxe self-catering unit with 2 bedrooms (amenities, wall safe, robes, slippers, hair dryer), 2 bathrooms, a fully-fitted open plan kitchen / dining area, lounge, sleeper couch (children under 12 stay free), DSTV, DVD player and private patios. The unit also has under floor heating and air-conditioning to ensure your comfort throughout the year. A barbecue area is specifically reserved for this unit. There is also a one bedroom unit (amenities, wall safe, robes, slippers, hair dryer), with a shower bathroom and a fully fitted open-plan kitchen / dining / lounge area with a sleeper couch (suitable for children under 12 years), DSTV, DVD player and a lovely patio with views of the beautiful landscaped gardens, pool area and ornamental dams as well as the magnificent mountains. The unit also has under floor heating and air-conditioning to ensure your comfort throughout the year. There is a barbecue area close by which can be reserved for your use. 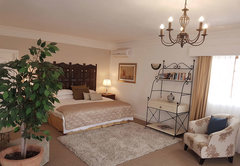 Val d’Or Guest House is one of Franschhoek’s most luxurious and relaxing places to stay, offering easy access to the Winelands’ many attractions and sought-after golf estates. It is an idyllic country setting in which to shed city stress! The mountain view suit consists of a large double bed and separate lounge area, leading on to the deck. There is a separate seating area on the deck overlooking the mountains and garden. The bathroom includes a shower and a bath. DSTV, air conditioning. 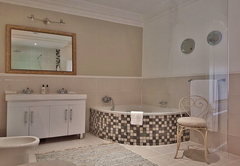 The luxury family suite has a full bathroom, tea/coffee making facilities, sleeper couch, televisions, DSTV, safes, robes, underfloor heating and air conditioners to ensure your comfort. Patio. Views. This luxury self-catering unit has two bedrooms, two bathrooms, sleeper couch, fully fitted kitchen, dining area and lounge - TV, DSTV, DVD, safes, robes, slippers, underfloor heating and air conditioners to ensure your comfort. Own patio and braai area. Owners cottage consisting of 3 bedrooms, en-suite bathrooms, open plan kitchen, dining, lounge , private braai fa cility and stunning views. The owners suite has a kitchenette with a microwave and coffee making facilities. Air Conditioning Bar Fridge Hairdryer TV Satellite TV Internet Ready View Towels Microwave. 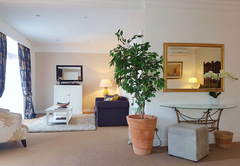 The luxury Garden Family suite consist of 1 double room interleding into a twin bedroom with bath/shower to share.This unit has small kitchenette facility available and private patio. My daughter and I stayed one night and it was more than we expected. We were the only ones taking advantage of the pool in wonderful surroundings. A member of staff swiftly offered us a complimentary drink as there was some noise from nearby building works. We hadn't really noticed and it was very astute of him to have been aware. Lovely breakfast outside. The room was large and excellent shower. Would certainly recommend. Absolutely Brilliant wedding at Val d'Or We must thank Val d' Or Estate, for an absotuely stunning wedding. They went out of their way to make sure everything was perfect, from the decor and ceremony - right through to the reception and food. We had the best time, and our guests had all their needs catered too as well. The perfect venue for a wedding where we could share the weekend with with our friends and family, all in one place. Response timeVal d'Or Estate typically responds to requests in 5-10 minutes.